We all know a certain “holiday” is tomorrow, however I grew up in a predominantly Italian-American neighborhood (I even speak Italian, albeit I’m pretty rusty now, but I did study it for 7 years and can basically read it still) and two days before after St. Patrick’s day is St. Joseph’s Day. Now, as I have been without religion going on almost 20 years, I really don’t know (remember) much about the man, or what the holiday is about, not unlike St. Patrick as well (snakes and stuff, right? ), but since I know that the 19th was another “holiday” or saint’s day or… there’s a lot of specific information that is becoming increasingly apparent to myself, and to you, that I am oblivious of… anyways, let’s make a drink to commemorate the oft-overlooked saint with a classic “Italian” (I’m sure this is disputed somewhere) drink, the Negroni. Hey, this means TWO celebratory reasons to drink this week. You’re welcome. In a rocks glass with ice combine all 3 ingredients. Garnish with the orange slice. Salute! Is it sad that I just remember St. Joseph’s day as an excuse not to wear a uniform to school, wear red instead, and eat zeppoles? Ahhh… zeppole. I think I’ve complained on numerous times that it is impossible to find a good one here on the west coast. 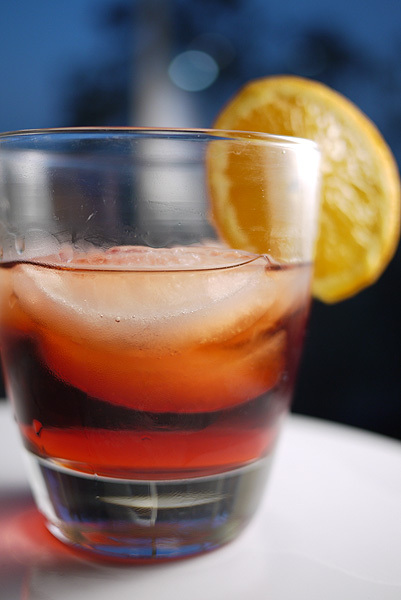 Negroni go down easy for me.. I really like the bitterness of the drink. I just need to find other recipes now to make with the bottle of Campari I have here. And totally not sad at all! Any excuse not to wear a uniform was welcomed back in the day.